So much work went into this Father Christmas stocking! Father Christmas is decorating hand stitched Christmas tree. The tree has actual mini ornaments and beads. The poinsettias are also embroidered with beads. Truly a beautiful and unique stocking! Personalized in embroidery. We have a matching stocking with a Christmas tree so you can make a set. Materials: The stocking is made from ultra seuede. Applique in velvet and and cotton, beads and ribbons. 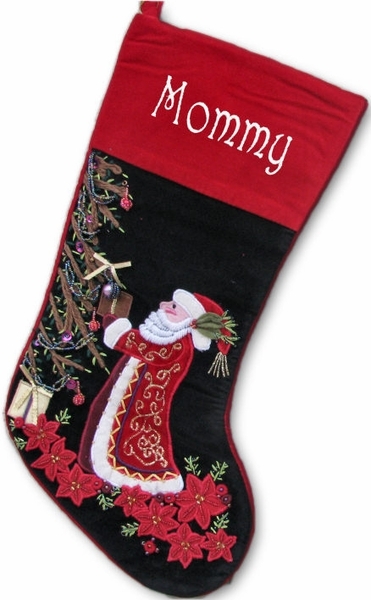 Names can be personalized on the velvet cuff of this Christmas stocking with GOLD, RED, SILVER or WHITE metallic embroidery thread to compliment the design of this Christmas stocking.